There are times when a story can tell you more about a business than any amount of advertisement. This is our story. Adam was our first pup from our first litter as a team. He taught us a great deal about ourselves. Adam at 4 weeks old was found by Dan seizing with his head underwater in the puppy water dish in the kennel. Dan gave Adam dog mouth to mouth. Adam was revived, yet continued to have seizures. The Machado's found a vet that was available late on a Saturday night. Adam spent two days in intensive care before they were able to stop the seizures. Adam spent another day in the hospital as they adjusted his medication. The Machado's brought Adam home and after a week there have been no more seizures once he stabilized we felt we could place him if we could find help. Adam was an outgoing happy puppy with a wonderful personality we wanted to place him in a special home that could and would care for him. We went though a local lady who volunteered her time and she found a wonderful family to become Adam's forever family. There were requests we made to the new forever home with the new family willing to meet those requisites we gain a new member to our emailing family. We do not breed for any one color, do not cull on spots, or other show based traits these dogs are working dogs for working situations. They were and are a breed to help a person work their livestock to the point they are nearly another hired hand to the owner. Some where in this litter is our Evie. 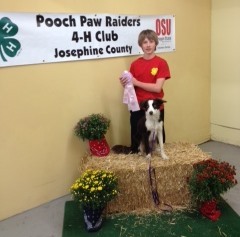 This litter had two dogs that have help their young owners place in their county fairs for obedience. This is Jack and his dog. Each morning these two go for a walk with their owner, keeping her life filled with joy we are told the rest of the day. our breeding program so that there will be pups tough enough to work cattle yet still be your ride along buddy the rest of the day. 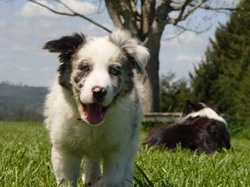 Not all of the dogs will make the cattle dog cut, these go on to become goat, sheep, and other farm livestock herding dogs, or farm dogs some call farm collies. Something that is more of an all around helper on the farm or homestead. Do not forget those that are looking for agility dogs as the same traits that make a good herding dog work out to be good doing agility. The family took Adam, placed him on a special diet, worked with veterinary college, nurtured him, and loved for Adam. The family chose to put Adam on a holistic program, Adam has not had any seizures on the program. Adam went on to get certified as a service animal, going to schools and retirement homes bring smiles of delight to faces of all ages. Adam goes to a local vet school often as their poster child on what a border collie with seizures early in life can do with the rest of his life. Adam's owner now has a program where they help troubled children ride horses as part of their recovery from what troubled them. Adam is part of a back bone to their program. Adam's owners keeps in touch with us from time to time as they know the care and devotion we have for this breed. We do not take the easy road, but the best road we can. We owe the family a great deal of thanks for their devotion to this wonderful dog. Long Live the ADAM in us all. 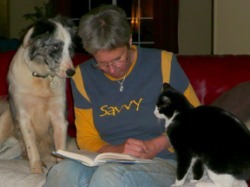 Adam and his owner sit and help his owner read while keeping the cat in line. All puppies like Adam grow up. This breed of dog is energetic, hole digging, kennel climbing out, fence clearing in a single bound, I see something feel a need to bark, prey driven dog. Border Collies can be blue, golden, coats can be ultra short to very long and full, , black, white, red, and many colors in between. 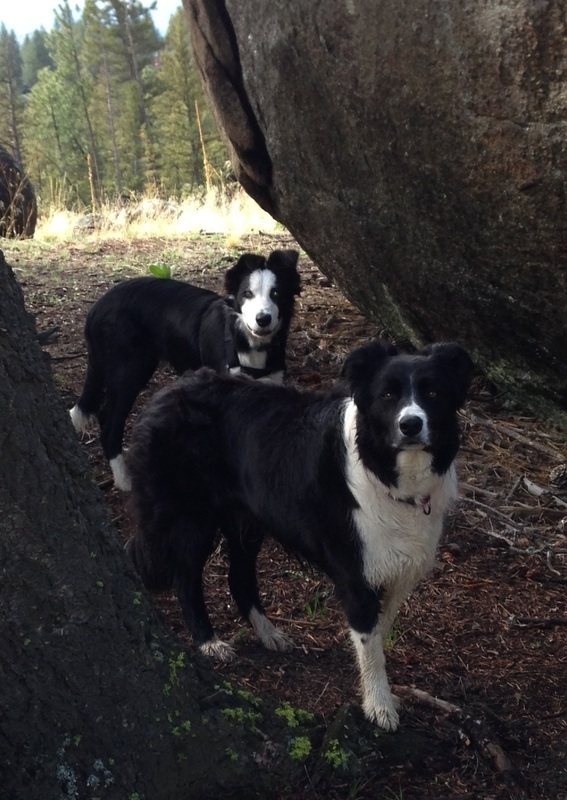 We do not breed for color rather herding ability, personality, temperament, and work ethic. We do retire sires, dams, or pups which for some reason come back to us now and again, contact us to see, if any are or will be available. Our goal is to breed, raise, and train dogs that we would want to share a day working beside and at night by our side.